Suiting has made a big impact on women's fashion. Whether "le smoking" or just menswear inspired, and let's not forget Julia Robert's Givenchy ad, women love to take a style cue from the guys. And celebrity children are no exception. 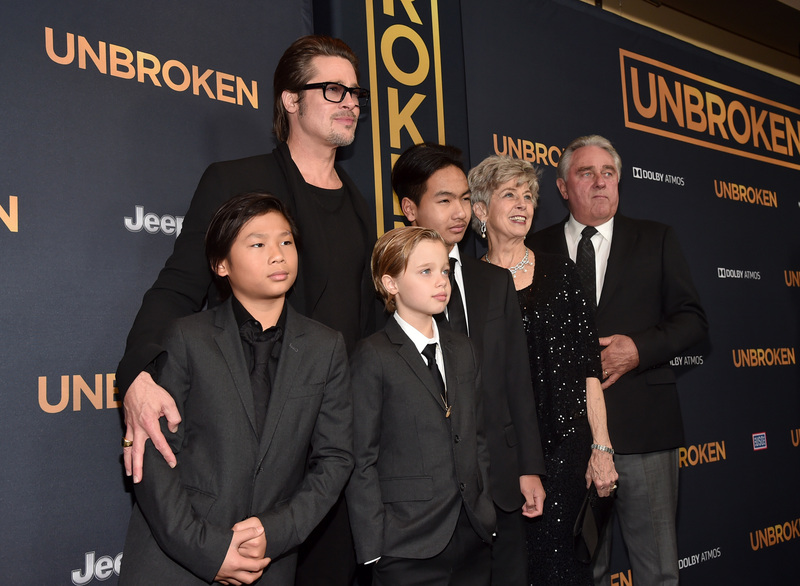 Shiloh Jolie-Pitt wore a suit and tie to the Unbroken premiere, and looked like one stylish (and please, stunning) tiny human. Because Shiloh's mom, Angelina Jolie, had the chicken pox and was forced to miss her premiere, she sent husband Brad and the kids in her place, instead. Shiloh looked suave and sharp for the Los Angeles premiere in a black suit and tie with a white button up, matching her brothers Maddox and Pax. With her slicked back hair, she was the epitome of effortless cool, which is obviously all the more adorable on an eight-year-old. Shiloh has always gravitated her personal style towards menswear, so it's nice to see her keep to her comfort zone on the red carpet. And with those baby blue eyes and luscious lips, there will no doubt be several fashion campaigns clamoring after this one. But Shiloh isn't the only kid in Hollywood to rock a tux, so here are some celebrity youngsters who rock suiting. Looking chic in their matching suits. Shoutout to hot dad, Brad. The youngest Beckham is quite the dapper one. Madonna and her eight-year-old son David went matchy-matchy in tux's for the Grammy Awards. Rachel Zoe's little one rocks a white suit. It's not a tux, but Blue Ivy was the cutest baby Michael Jackson I've ever seen in her red jacket and black tuxedo pants. The king of debonair babies.